In the archaeological news currently is the famed ca. 2000-year old Portland Vase, an ancient night-dark-blue-backgrounded/white-figure-overlaid artefact of undeniable "heavenly" beauty, originally excavated in Rome, and now found in the British Museum in London. See the photos of the Portland Vase at Wikimedia Commons. • the second secret was who are the procession of figures represented on that vase and what is their meaning. How was the Portland Vase made? New evidence challenges long held theories. New challenge to centuries-old theories on Roman glass. Our own expertise, however, concentrates on an unraveling of the second secret, as revealed in our newly made "astronomical" decipherment of the procession of white figures on the vase as depicting ancient mythical Roman gods in their heavenly starry abodes in the night sky. Others before us in Classical Studies have in fact suggested that the vase figures depict ancient gods, i.e. "Olympians", but it was not known what exactly was being depicted by those figures as ancient "gods". We suggest now, for the first time in modern academia, that the depiction is quite clear -- when viewed, with sufficient deliberation, from the standpoint of ancient artistic stargazers depicting their "heavenly" gods in the stars, via the background of a dark-blue firmament as the sky. of the Portland Vase is easily followed and is surely correct in its general explanation, even if many details may yet remain to be explained. • The stars of Boötes are represented by the male figure standing in the hall column having only one upright pillar to the left and one lintel (viz. (chief) beam, epistyle or architrave) extending to its right. • Boötes holds the stars of Serpens Caput in the hand of his lowered extended right arm [to the left from the viewer's perspective]. • The stars of Virgo are represented by the female figure below and to the right of Boötes [from the vase viewer's perspective]. • The stars of Coma Berenices (or is this Ursa Major ?) are represented above Virgo by a winged cherub. • Virgo holds the head of what others have identified as a (water) serpent (Hydra ? ), but it could very well be a long-necked swan at Leo. • The "Y-shape" of the stars of Cancer is shown as an upward extending tree of life. • Gemini is shown as a young man representing also the astronomical lower "twins", as in the more ancient cultures before them, which saw Castor and Pollux as the "upper" twins of the Gemini rectangle. • Auriga is a head to the right of Gemini (from the vase viewer's perspective). • Perseus follows as a young male god with his arms and left elbow marking the shape of Perseus. • The gaze of Perseus is on Andromeda, who here marks the stars of the Great Square and what we today call Pegasus. • Here the tree extending upwards marks the stars of what we modernly call the astronomical constellation of Andromeda, with the stars of Cassiopeia represented by the butterfly-shaped leaf bunch above Perseus and the stars of Cygnus and/or Aquila represented by leaf clusters on the other branch of the tree. • The left arm of Andromeda holds a straight sash down to the bucket of Aquarius. • The young god holding a staff (Serpens Cauda) is Ophiuchus and Hercules above Sagittarius. The calendric seasons of this era may also be marked on the Portland Vase by the positions of the trees and figures, but for now, we wanted to keep it simple. AndroidKenya (AK) reports on the "new"ly named Microsoft Launcher for Android. Looks interesting. Take a look. We like the integration with the PC. The AC DC Wars of Edison v. Tesla have returned. Take a look at "current" developments. Lawyers and Legal Writers beware! Does the serial comma make a difference to lawyers and legal writing? Absolutely! Monetizing Multimedia Rights in College Sports: Will the Merger of Learfield and IMG Pass Antitrust Scrutiny? Read Kevin Draper at the New York Times in A Big College Sports Business Is About to Get Bigger. People who do not understand ancient cultural sites should have nothing to say about what is to be done with them. The Shrinking Stonehenge Scandal is one example. "Zenith breaks mechanical-timekeeping performance barriers with a radically different oscillator system." “The available evidence was insufficient to support the assertion of an antidoping rule violation against these 95 athletes." We do not comment on the sports politics involved here because we simply have no first-hand information about that, as most commenters also do not, many such commentaries being merely idle speculation and opinion, without supporting factual basis. Important to note is that protection of athletes should be the top priority of any anti-doping agency and that doping charges should not be levelled at anyone without sufficient evidence. That principle has been applied here by the World Anti-Doping Agency. The erroneously patented 1-Click patent ends. See Lexology for new developments in trademarks and trade due to CETA at CETA to Come Into Force September 21, 2017 - Things to Know About Geographical Indications. Your information is used to continually deliver innovative, engaging and entertaining products and services to you. We believe that we can more efficiently deliver a better experience to you by sharing user information across the various Oath brands and within our Verizon family of companies. We will use this shared information to integrate and improve our services, and to provide more customised advertising & content, as well as for other analytics purposes. We will share the same information that our companies have previously collected and used for the development and operation of our products and services. This may include your account registration information (such as your user ID, gender, name, email address, postcode & age), your content and advertising interests, content associated with your account, the types of services you use and how you engage with them, cookie and device IDs, IP addresses, geolocation information and activity information from across our websites, apps, software and other services. Yahoo users are empowered to shape their privacy preferences. Your ad personalisation opt-out preferences will also be shared and honoured across Oath ad systems. We recommend that users take advantage of these options to optimise their experience; however, should you prefer that Yahoo does not share any personal information with Oath and/or the Verizon family of companies, instructions on how to delete your Yahoo account can be found here." Thousands of tickets at $25 a clip sold out in nothing flat to economically wily purchasers and many are now available at multiples of that price on Craigs List. The powers that be in "Art" need to learn better how to deal with the law of supply and demand in marketing their art exhibitions. Immigration law in the USA remains a complex issue. there is no denying that sensible, documented immigration is important. It is one view of many, of course, but it highlights one aspect of America that needs to be taken into consideration in forging sensible immigration law. Wired Looks at Western Digital SanDisk's Brand New 400GB MicroSD Card: What Can You Use It For? Wired looks at Western Digital SanDisk's brand new 400GB MicroSD Card. What can you use it for? Take a look at: SanDisk’s 400GB MicroSD Card Can Store an Insane Amount of Data This is not a paid ad but simply our opinion. Interesting study published at the Harvard Business Review that suggests that CEOs with Law Degrees top MBAs in certain kinds of effectiveness. We have long been skeptical about theoretical black holes in space because they confound logic. Real science must be based on evidence. New research has provided evidence that black holes -- in the model propagated over the last decades -- simply do not exist. It is VALUES that count in the long run, which has long been forgotten [not just in the USA]. Jason L. Riley has a seminal piece on race relations and values in America in light of recent monument-downing turmoil. To turn the ship back on course, one must return to the proven values. Drudge Now reports that San Francisco's legendary left-wing politician Dianne Feinstein thinks that Donald Trump could become a good President if he is willing to learn and change. To better understand what is going on in America politically, it is instructive to read Zakaria at CNN on Why Trump won and what aspects of that Presidential election win remain intact as strong forces in US politics. See the fabulous Vision Mercedes Maybach 6 Cabriolet Concept Convertible at RobbReport. Trump is proving to be a motor for an economic resurgence of the New York Times. No fake news here. "After posting strong earnings Thursday, The New York Times Company shares have surged to a nine-year high. The company has seen a sharp increase in digital subscriptions, largely attributed to the "Trump effect," since last November's election." Journalism is a business. To put it bluntly, in a real straight "news article" rather than a derogatory opinion piece, the boys and girls at the New York Times might consider ALSO thanking Donald Trump for being good for THEIR business and livelihood. The reality of "the news" is somewhat different than the frequently partisan and oft biased reporting world. All things have varied aspects. Or, in other words, let's keep things in a balanced perspective, folks. See MIT Drone Fleets Track Warehouse Inventory. "If you are a hobby photographer, an ambitious newcomer or a Flicker user, you might already know a lot about the Creative Commons licenses (CC licenses). However, what exactly is meant by this type of license often remains unclear. Copytrack is going to break it down. It helps to understand how the license works and what needs to be considered when using it. If applied correctly, the CC licenses are a clever and quick way to license your images for free. The company behind the licenses is a non-profit organisation which offers easy-to-create, templated license contracts for the rights holder to share their protected work. Put simply, these license contracts are generally accepted license contracts which regulate the most important questions around the usage of copyright protected works. The so-called CC licenses are standardised and can be applied internationally. There are currently four versions of the six different licensing agreements. The work can essentially be offered for free. Every time the image is used an attribution has to be given. No matter what, the licenses are irrevocable. That means: whoever receives the image with the license to start with can carry on using, even if the photographer changes their mind later on. Attribution, non-commercial usagesThe image user can copy, edit, and share the work, only for non-commercial purposes. The licensor has to be attributed.CC BY-NC-SA Attribution, non-commercial usages, & share alikeThis license states that the image cannot be used commercially. It also implies the image cannot be edited and it can only be shared under the original license. As always, the image user must attribute the creator.CC BY-NC-ND Attribution, non-commercial usages & no editingWith this license, the image user cannot edit the image. The image cannot be used commercially and attribution must be given. There are no other possible combinations! When you need help to find the appropriate license for your purposes go to https://creativecommons.org/choose/ for an application form, and with a just few clicks you can find the right license. Here is an example of how a full attribution can look like: "Image XY" [link to image source] by Sam Davies, desaturated and trimmed by Monika Hurst, licensed under CC BY [link to license]. The CC licenses are not clear in some areas. For example, "commercial use" is not explained in detail. It is only stated that a commercial use is an act that aims at a business advantage. This wording consciously creates legal uncertainty to cover a wide range of meanings. At the same time, this wording creates a legal uncertainty. For the evaluation of the license, the image usage is the focus. The definition does not focus on where the image is being used. Our tip: Creative Commons licenses are a great way for photographers to provide their photos to third parties. Through their application, the photographer creates legal certainty for himself or herself and for the image-user, which ultimately gives him or her a better possibility of sharing the work. With the mandatory attribution, a picture passed with a CC license also helps to promote the photographer. Copytrack (www.copytrack.com) was founded in 2015 by Marcus Schmitt and currently employs around 25 people from legal, IT, customer service and finance. The service supports photographers, publishers, image agencies and e-commerce providers. It includes a risk-free search of the global Internet for image and graphics data uploaded by users at Copytrack are found with a hit accuracy of 98 per cent. The customers define if images are used without a license and even determine the amount of subsequent fees supported by an automatic license calculator on the portal. Copytrack is fully responsible for an out-of-court solution in over 140 countries as well as a legal solution in the areas relevant to copyright law. If the image has been successfully licensed, the rights holder receives up to 70 percent of the agreed sum. The pure search function is free of charge. As reported at the New York Times, Wall Street Journal Chief Editor Gerard Baker lashed out at phony journalism and fake news reporting. We are a bit late on this important intellectual property court case decision in Europe, as the European Court of Justice has ruled that torrent site Pirate Bay infringes copyrights. The case will probably harken the end of provider sites that knowingly enable media pirating by torrent streaming or otherwise. What happens when the "locally-elected" representatives of the U.S. Congress try to break out of their provincial hamlets and -- Walter-Mitty-like -- attempt to enter the big stage of international affairs to play President and to conduct foreign policy? The immediate result, as we see from news reports, is the quick souring of world politics on an unprecedented scale, even among allied nations. See the BBC News piece at Russia's Putin orders 755 US diplomatic staff to be cut. Nothing the Trump administration may have done wrong in the last six months compares in stupidity with this inexcusable Congressional overreaching of its Constitutional legislative powers, which are normally subject to the doctrine of the "separation of powers" that marks the executive, judicial and legislative branches. Without ANY probative evidence that the Russian government actually interfered in the past U.S. Presidential election, Congress has usurped the President's Constitutional duties and has decided to go ahead with stiff retaliatory sanctions against Russia anyway -- usurping thereby the foreign policy sphere of the President -- and even threatening U.S. allies in THEIR economic relations with Russia if they do not toe the U.S. Congressional line. Normally, the President makes foreign policy, not locally-elected foreign-policy-clueless local State representatives. No sane nation conducts foreign policy through parliaments... and for good reason not. So, what now? Another Act of Congress in retaliation ... etc. etc.? Surely the people in Congress jest! This Congressional usurpation is all the more difficult to understand given the widespread ignorance among voters and their locally-elected State representatives about all things foreign. In the USA generally, try finding any news beyond even greatly limited local happenings on your local TV channels or radio stations. The rest of the world is mostly invisible somewhere "out there". As one U.S. cashier in the dark fields of the republic said to a customer (true story): "Y'all talk funny. Where ya from?" Answer: "London". Reply: " Is that near England?" That and similar knowledge gaps are not a good information basis for foreign affairs. And that is why parliaments are not responsible for foreign policy. Lana BirBrair @HarvardLaw comments on a lecture by the Bruce Bromley Professor of Law John Manning in the "Last Lectures" series -- To be happy lawyers (and human beings), eight rules for law students to live by. Useful! and well worth a read. Debra Cassens Weiss has the story at the ABA Journal in Patent lawsuits drop 21 percent in the Eastern District of Texas as SCOTUS ruling brings new era. Look at the image below. Look familiar? ultimately replacing the more ancient "scrolls". Given the contemporary phenomenon of the digital tablet or notebook viz. laptop, many a disciple of modern hardware and "tablet patents" or similar would be surprised to discover that the "wax tablet" with stylus was already popular in Ancient Greece, as shown in the image below, dating the folding wax tablet to at least 500 B.C. What is new under the Sun? "Stanford Law School faculty members offer commentary on key SCOTUS decisions from the 2016 term (most issued in spring 2017), offering critical analysis." Should judges serve for a life tenure or should they step down at e.g. age 80? Contrarily, Debra Cassens Weiss at the ABA Journal reports on the opinion of Judge Posner, age 78, who suggests that judges should step down at age 80. See 'No need for octogenarians' on the bench, including those on the Supreme Court, Posner says. What a marvelous read about U.S. Supreme Court Chief Justice Roberts this is! If you have ever doubted that Chief Justice Roberts lacks wisdom, think again! Read Debra Cassens Weiss at the ABA Journal in Chief Justice Roberts tells students he hopes they will experience challenges rather than success. It is an interesting commentary on how we obtain wisdom through experience. Peter (Pete) Robert Haje, age 82, born July 31, 1934, passed away on July 2, 2017 in New York City. See the New York Times obituary. The photograph below was taken in New York City in the year 1995 at the Helmsley Palace (recently renamed Lotte New York Palace). When built, it was the tallest hotel in New York City. Peter Haje at the time of the photograph was Executive Vice President and General Counsel of Time Warner Inc.
Peter Haje is in the middle of the photograph below (copyright Andis Kaulins), flanked by Andis Kaulins and Michael Rohrdrommel, who were on their way from Germany to California to meet with Sam Tramiel of Atari to try to negotiate a contract for distribution in Germany of the Atari Jaguar, a home video game console. One must recall, coincidentally, that Jack Tramiel had purchased the Atari consumer division of Atari, Inc. from Warner Communications. Peter had invited us for a friendly lunchtime chat at the Helmsley Palace after we had visited him in the executive offices at Time Warner headquarters in Rockefeller Center. 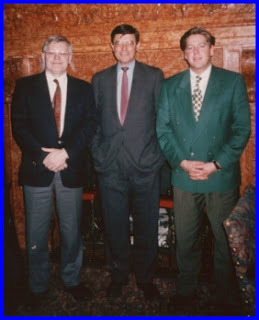 Peter had been a mentor to Andis Kaulins, the LawPundit, during the LawPundit's tenure as an associate at Paul, Weiss, Rifkind, Wharton & Garrison, and "Pete" remained a dear friend for many years, even after the LawPundit moved to Europe and to other disciplines and projects. As written in the title of this posting, the LawPundit regarded Peter Haje to be a brilliant mind, a "born" lawyer, and a great guy. Thank you, Peter, for having been an important part of my life. in Supreme Court makes venue shopping harder for patent trolls. U.S. Supreme Court Unanimously Reverses Long-Standing Lax Federal Circuit Patent Venue Rule. Walsh refers to Stanford Law School intellectual property expert Professor Mark A. Lemley, who calls the Heartland decision SCOTUS's "most important patent ruling" since the Supreme's 2014 decision in the patent eligibility case of Alice Corp. v. CLS Bank International ("what is patentable subject matter"). TC Heartland LLC v. Kraft Foods Group Brands LLC. Change was necessary! We have grown frustrated with newer Google Search algorithms which seem to produce more and more first page search results that we do not want and which appear geared to the lowest common denominator of interest, or perhaps to ad money, we do not know. You may of course not share that view. However, we are switching away from Google Search as perhaps having hit its peak and now possibly finding itself sliding downhill in terms of performance. Also the "green" search engine Ecosia, "Plant trees while you search the web", appears to be quite good in returning useful search results -- results that appear similar to Yahoo Search, so we are going to give Ecosia some search action in the future. Try it out. Fed up with the increasingly invasive practices of the standard browsers, we have also just tried out Maxthon MX5 as an alternative fast, secure and ad-free browser. We nevertheless remain fans of the Pale Moon browser which bills itself as "Your browser, Your way". Pale Moon was forked some years ago from Firefox and retains the original genius of Mozilla Firefox, which was that the USER -- not the programmers -- should decide how the browser was to function, a laudable goal long lost at Mozilla Firefox. as the top collegiate athletic program for an incredible 23rd straight year, a record of excellence which remains as amazing as the record amazingly is. In Division I, Ohio State finished 2nd, Florida 3rd, USC 4th, North Carolina 5th, Michigan 6th, Texas 7th, Penn State 8th, Oregon 9th and Kentucky 10th, just edging out UCLA 11th and Texas A&M 12th (the 12th Man!). Grand Valley State of Allendale, Michigan won the NCAA Division II title for the third straight year, Williams College of Williamstown, Massachusetts won the NCAA Division III title for the fourth straight year, while Lindsey Wilson College of Columbia, Kentucky won the NAIA title. This not an ad, just our report about a pocket-size camera mini-drone of the new generation. At Mueller.de in Germany for a reduced price of €69.99 we just acquired the DF-Models.com "Drive-Fly" 9300 SkyWatcher Pocket Racer Camera Drone with Controller (+ WIFI smartphone control via the VS FPV Android app (Google Play)). The SkyWatcher Pocket Racer quadrocopter can be ordered online but must be picked up at a Mueller.de general market store of choice (toy department). For us, it was a shopping deal for obtaining at a bargain price one of the new generation of camera "mini-drones". For comparison, the SkyWatcher Pocket Racer is listed by a shop in Amazon.de at a price of ca. €108 (plus free delivery). Klappbarer „Selfie-Copter“, steuerbar per Controller oder Smartphone. Videos oder Fotos können per WiFi-Übertragung auf das Smartphone gespeichert werden. Automatische Start-/ Landefunktion und Höhenstabilisierung. 2,4 GHz Controller, Flugzeit ca. 8 Minuten, 100 % RTF Akkus und Zubehör inklusive (Es wird kein weiteres Zubehör benötigt!). Kamera mit FPV WiFi Modul"
Foldable "Selfie-Copter", controllable via controller or smartphone. Videos or photos can be saved to the smartphone via WiFi transmission. Automatic start / land function and altitude stabilization. Camera with FPV WiFi module"
Thus far, in our opinion, this beats the competition as regards quality and price. However, we make no statements or guarantees about drone performance or suitability to purpose. After all, this is a toy.... but nevertheless potentially dangerous, especially to children (and adults!) of all ages, due to freely open, otherwise unprotected fast-spinning rotor blades as well as the use of lithium batteries. You have to read the manual (! ), follow its instructions and know what you are doing!! Germany's apprentice programs are fabulously successful. The Trump Administration's apprenticeship initiative makes great sense given the example of the German model. See the report at Forbes. This is one way the Trump Administration is surely moving America forward. the constitutionality of the different treatment of citizenship of children born overseas, based on whether the unwed parent was the father or the mother. SCOTUS ruled that Congress must enact a law treating both genders equally as regards the citizenship of children born overseas to unwed parents. "Ginsburg said the law was based on flawed and outdated assumptions about men and women that pervaded the country's citizenship laws: "In marriage, husband is dominant, wife subordinate; unwed mother is the natural and sole guardian of a nonmarital child." For close to a half century, she [Ginsburg] said, the court "has viewed with suspicion laws that rely on overbroad generalizations about the different talents, capacities or preferences of males and females." Ginsburg said the gender line Congress drew "is incompatible with the Constitution's guarantee of the equal protection of the laws to all persons."" Is Brexit Now Gone Before it Really Started? Is Brexit now gone before it ever really started? "We’ve made a list that tells you that Stanford Law School is the best school." The (virtually) unanimous 8-0, 7-1 May 30, 2017 decision of the U.S. Supreme Court in a landmark opinion written by Chief Justice Roberts holds that the patent exhaustion doctrine applies to all products sold, domestically and abroad (Ginsburg dissenting on the latter), and that patents can thus not be used to circumvent the first sale doctrine. Our previous analysis was thus once again proven correct, as it has been for many years in predicting U.S. Supreme Court reversals of what we have regarded to be clearly erroneous Federal Circuit Court decisions in the patent sphere. For a detailed analysis of this eminently important patent case, see Patently-O: Impression v. Lexmark: Patent Rights Exhausted by Sale, Domestic or Abroad. The "international" patent rule voiced here by the Supreme Court follows the same general and inexorable legal logic applied regarding the limitation on copyrights expressed in Kirtsaeng v. Wiley, 568 U.S. 519, 133 S. Ct. 1351 (2013). Andrew Klavan on the ongoing investigations of our otherwise government do-nothings. The U.S. Supreme Court continues its -- clearly necessary -- reshaping of a patent law landscape that long ago passed the limits of common sense. after oral argument on the case had already been held). See a summary of the holding at TC Heartland LLC v. Kraft Foods Group Brands LLC. As political centrists -- swing voters who decide elections -- our non-partisan views sometimes find us siding with Republicans, sometimes with Democrats, sometimes with Independents, and sometimes with none of these. For example, we find the controversy over Trump and the Russians to be an unnecessary, deplorable media-created tempest in a teapot about nothing of consequence, as Trump rightly says, a politically-motivated witch hunt. By contrast, however, we are very much on the other side of the political fence as concerns the Trump-administration's apparent decision -- a stupid one in our view -- to try to topple Net Neutrality. Greedy institutions and people are trying to torpedo the existing long-standing standard of Net Neutrality -- which benefits us all -- and instead to bring to the World Wide Web the same flawed system of discriminatory privilege that marks the cable television industry. "An open letter to everyone who uses the internet"
Portugal's Salvador Sobral won the 2017 Eurovision Song Contest in Kiev with the song Amar pelos dois ("Loving for the two of us"), written by his sister Louisa Sobral. The annual competition was televised live and also You-Tube streamed to hundreds of millions of viewers across the globe as the world's reigning most popular live non-sports entertainment show. Bulgaria came in second, Moldova third, our personal favorite Belgium fourth, and Sweden fifth. It was Portugal's first ever win since entering the Eurovision Song Contest competition in 1964. "In the 1950s, as a war-torn Europe rebuilt itself, the European Broadcasting Union (EBU)—based in Switzerland—set up an ad hoc committee to search for ways of bringing together the countries of the EBU around a "light entertainment programme". At a committee meeting held in Monaco in January 1955 with Marcel Bezençon of the Swiss television as chairman, the committee conceived the idea (initially proposed by Sergio Pugliese of the Italian television RAI) of an international song contest where countries would participate in one television programme to be transmitted simultaneously to all countries of the union. The competition was based upon the existing Sanremo Music Festival held in Italy and was seen as a technological experiment in live television, as in those days it was a very ambitious project to join many countries together in a wide-area international network. Satellite television did not exist, and the Eurovision Network comprised a terrestrial microwave network. The concept, then known as "Eurovision Grand Prix", was approved by the EBU General Assembly in a meeting held in Rome on 19 October 1955, and it was decided that the first contest would take place in spring 1956 in Lugano, Switzerland. The name "Eurovision" was first used in relation to the EBU's network by British journalist George Campey in the London Evening Standard in 1951." The Eurovision Song Contest has many supporters and viewers but also detractors, the latter of whom seem to expect a perfection of competition that is simply not realistic. The Eurovision Song Contest may not be perfect -- surely everyone can agree on that point -- but it beats alternative forms of competition among nations -- need we mention wars -- by a long shot. Given a choice, we take ... MUSIC! Blanche ("Ellie Delvaux") -- Sings "City Lights" for Belgium in the May 13, 2017 Eurovision Song Contest Final - We Find It the Best Song This Year, But Can Blanche Win? Our own personal favorite in the Eurovision 2017 Song Contest Final on May 13, 2017 in Kiev is the unique, world-class song "City Lights" as sung by Ellie Delvaux -- going here as "Blanche" -- for Belgium. "City Lights" is a listener's playlist delight. Do yourself a favor and listen to it twice .... it grows on you. We find it to be the best song in the competition, but can Blanche win enough votes to win, as it will be hard to overcome traditional Eurovision Song Contest powerhouses from past years such as Sweden, which has won six times, lastly in 2012 and 2015, and goes into this final with one of the semifinal winners from the same semifinal in which Belgium was 4th place. However, since "City Lights" is a song that grows on you, it should be more competitive in the final voting as voters will have had a chance to get familiar with the song in the interim -- which can only increase its chances of winning. There are other fine entries in the competition as well of course, such as favorites from Italy, Portugal, Bulgaria and the United Kingdom, but we always look for a song with that extra "something". This year, "City Lights" has that "something" for us. Events of the present are just as integrally tied to the past, as the future is tied to the here and now. But getting people interested in the world of yesterday is much more difficult than motivating them to look to the future, even though both are equally important to an appreciation of human life on Earth. It is therefore of considerable concern that museum attendance in the USA in the digital age, especially among young people, has been declining strongly over the last decades. Young people particularly are losing their connection to their human heritage. Efforts are underway at various institutions to stem that tide. After all, to know where you are, and to successfully arrive at where you are going, it is advisable to know where you have been. The Verge in an article by Nikki Erlick at 20,000-year-old artifacts, 21st century technology reports that "Museums are turning to virtual reality, apps, and interactive experiences to keep tech-savvy visitors engaged." LawPundit is Approaching One Million Visitors viz. "Hits"
LawPundit is approaching one million visitors viz. "Hits". to permit us to go beyond our six-place present one. The new, stricter European Union (EU) General Data Protection Regulation (GDPR) goes Into effect in two weeks on May 18, 2017 as Germany, for example, rewrites its own new Federal Data Protection Act as a result. See for example the reports at Out-Law.com at New German data protection laws passed by Bundestag as part of GDPR preparations, as business organizations e.g. will in the future be required to appoint a "data protection officer". We have revised our initial decipherment of the Cerutti Mastodon Bone -- not by changing any of our illustrative markings or identified cupmarks, but differently interpreting those cupmarks and lines, putting Virgo and Leo higher up in the image, and in the lower part of the image adding Hydra, Corvus, Crux, the Large Magellanic Cloud, Carina, Vela and Canopus in Puppis. We also now identify a bird and its corresponding cupmarks in the upper left as Cygnus and below it a triangular form as Aquila. Below is the resulting NEW REVISED decipherment, which we have labelled "May, 2017" to keep it separate from the previous "April, 2017" decipherment, even though both are separated by only one day at the end of April. Usually, we do not publish decipherments immediately, knowing that revisions may be necessary, but here we wanted to get the work out quickly. Please Note: The sky map decipherment below was revised in part by Andis Kaulins two days later at http://lawpundit.blogspot.com/2017/04/revised-decipherment-of-cerutti.html, adding more star identifications and changing the position of Virgo and Leo to be higher up above the underworld of stars. Archaeology and related professions suffer from their tendency to opt for a self-serving myopic assessment of the available evidence, too often without sober consultation of what "science" might call "good common sense". When we take the evidence of genetic studies into account, then mankind migrated out of Africa no earlier than about 60000 B.C. according to the Map of Human Migration, National Geographic. Note that we reject and do not use the confusing and allegedly "politically correct" BCE and BPE labels, which are artificial ill-constructed academic notations with little practical value. ANYONE, no matter what their academic credentials, suggesting the discovery of prehistoric human or human-like locations and/or artifacts outside of Africa that fall far much earlier than that date of 60000 B.C. -- when faced with the genetic evidence -- is likely to have made a colossal dating error in setting the chronology. That may be the case for the Cerutti Mastodon bone. We have pointed out the above wisdom repeatedly over the years, most recently in our posting Bruniquel Cave "Ring" Construction in France Represents a Sky Map, But it is Not 176000 Years Old and Likely Not Constructed by Neanderthals. We now are confronted with a report in the New York Times headlined Humans Lived in North America 130,000 Years Ago, Study Claims, reporting on a study -- published in the purportedly reputable peer-reviewed science journal Nature -- whose editors and reviewers need to start to do their homework -- titled A 130,000-year-old archaeological site in southern California, USA. We are not going to go into any assessment of the radiometric procedures used in dating the Bone from the Cerutti Mastodon (CM) site in question, because it is not necessary, as there is no proof that the carvers of the bone broke the bone into pieces, as the writers of the article allege. Rather, an old broken mastodon bone from an earlier age was arguably found and carved at some later time -- indeed, based on our dating below, probably carved by the still mysterious, but surely then seafaring people of Haplogroup X (mtDNA), who spread their astronomy in the New World at that time. Some experts were intrigued by the research, but many archaeologists strongly criticized it, saying the evidence didn’t come close to supporting such a profound conclusion." The key to this mastodon bone is not only the correct interpretation of the carved wavy lines, but also a host of other carvings and cupmarks on the bone. We can explain the wavy lines, as a bonus of our decipherment. Anyone who thinks that he has seen all the carving on the mastodon bone when he or she has merely noted the wavy lines on it -- the easy part -- is greatly mistaken. We are reminded of Albert Einstein's famous phrase, that "I have little patience with scientists who take a board of wood, look for its thinnest part, and drill a great number of holes where drilling is easy." The head of Leo is to the right and can be viewed as either a human head or the head of a cat-like or dog-like creature. Behind that to the left is the head of human female with the wavy lines surely representing the watery underworld toward the southern stars of Centaurus, Lupus etc. Marked at the left are the stars of Sagittarius and Scorpio, both near the galactic centre, as marked by heads of the deceased, since the ancients believed the souls of the deceased returned there. See my many postings on Avebury Henge and Stonehenge in the last year for an explanation. 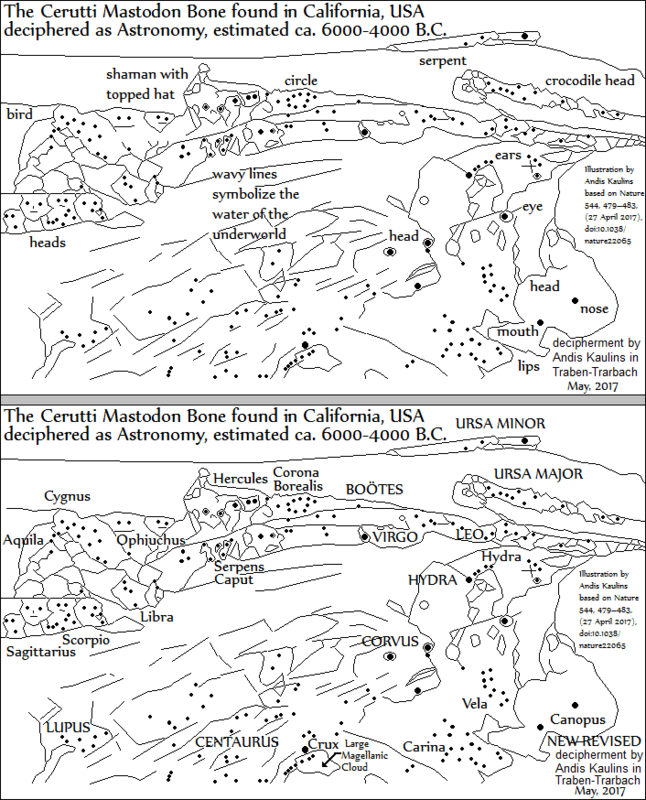 Groupings of stars that are represented on the Cerutti Mastodon Bone may not in ancient days have been exactly comparable to our own modern constellations of course, but decipherment experience shows that the ancients adopted similar groupings, based on the brightest stars in the heavens. 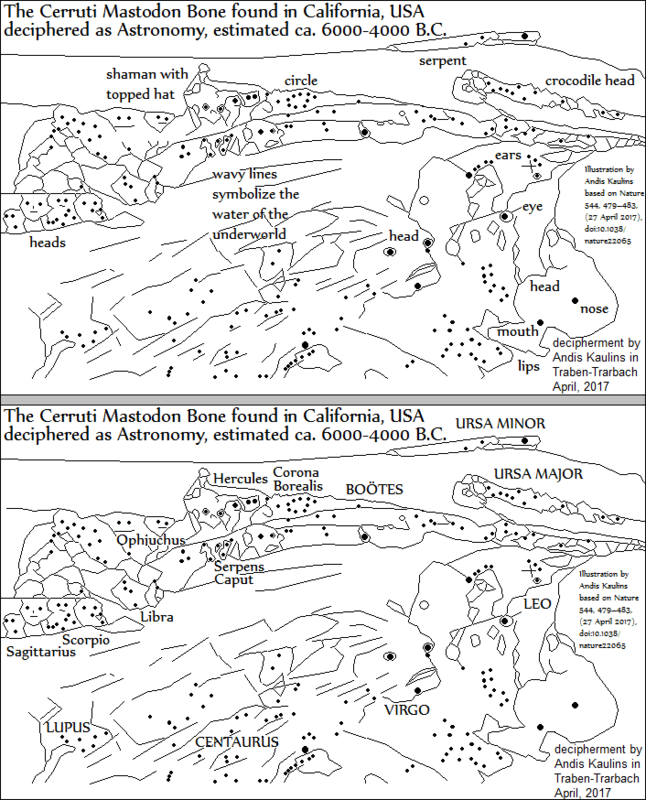 Below is our decipherment of the Cerutti Mastodon Bone based on Letter to Nature 544, 479–483, 27 April 2017, doi:10.1038/nature22065 and the image reproduced in the New York Times article cited above. The entire matter is rather elementary -- once one understands that the ancients carved mastodon and similar bones like this for important reasons such as astronomy, calendration and perhaps other shamanistic endeavors. We are paying more attention to our Twitter presence, which is now approaching 6000 tweets. We have updated our LinkedIn profile. Melania Trump, America's First Lady, is featured by Caroline Leaper, Fashion News and Features Editor at The Telegraph, in 'A modern take on femininity and elegance': designer Alice Roi reveals the story behind Melania Trump's First Lady look. What are the general trends that we might forecast for the near future? For those, we looked to art in its broadest definition. Trends in 2017 have been suggested at the linked websites as follows in fashion (femininity), art (reconnection with nature), visual design (return to organic roots, uncompromising clarity), interior design (vintage looks made modern), literature (Norse mythology), theatre (quality) and music (streaming and vinyl, nostalgia). These can serve as forecasting or parallel signals of coming or existing trends in politics and society generally. One might conclude that the trends have a definite direction and are found also in various "law and order" developments in law and politics worldwide. continues to win awards and gain recognition in the legal sphere in 2017. Paul|Weiss is an international "Big Law" firm of attorneys headquartered in New York City with offices in New York, Beijing, Hong Kong, London, Tokyo, Toronto, Washington, D.C. and Wilmington, Delaware. the Corporate Law Firm of the Year in 2016. Paul, Weiss et al. has a long, unique and storied history extending far beyond corporate law, so that recognition for legal excellence is nothing new. "Each of the three women serving on the U.S. Supreme Court in 2016 began her career as a summer associate at Paul, Weiss." Take a look at the quite amazing history of the firm. We tried out the World Route software program by SoftPerfect network management solutions in order to discover the path taken when readers access the LawPundit blog at Blogspot. "With the World Route tool you can easily find out what gateways your data goes through and how fast it travels. 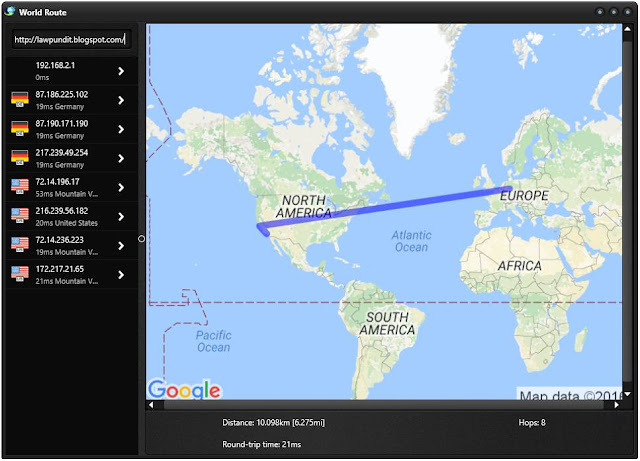 You will receive comprehensive route details, with each city and country conveniently marked on the map. 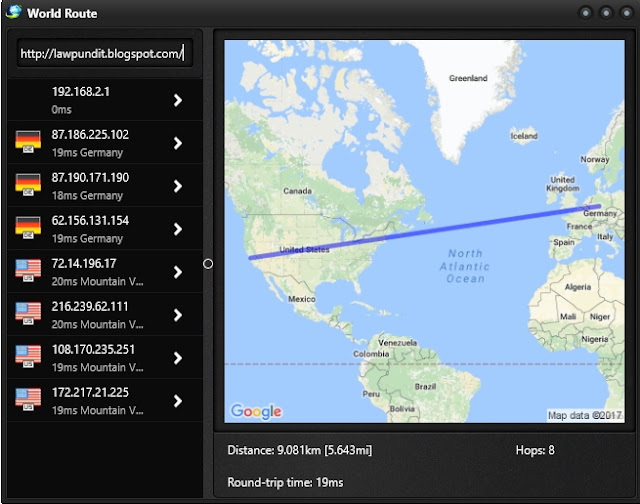 Simply enter any IP-address or website and see the path network packets take to that destination." The round trip times were 19ms and 21ms (ms=milliseconds). Pretty quick! Speaking of short-term vs. long-term thinking, U.S. Supreme Court Justice John G. Roberts recently made some cogent comments reported at the ABA Journal by Debra Cassens Weiss in her article Chief justice says partisan confirmation battles create 'real danger' for Supreme Court. Roberts addresses the problem of short-term thinking applied to the Supreme Court, when long-term Court execution of responsibilities is a judicial reality in which knock-down, drag-out partisanship has little place. Decision-making and tactics for long-term planning are discussed by futurist Ari Wallach at TED.com in Ari Wallach: 3 ways to plan for the (very) long term. 3) telos thinking (stopping to think about "to what end" is it all?). Disruptor Daily has a list of Big Data Conferences taking place in 2017. The Return of the BlackBerry? Will Increased "Big Data" Knowledge Dominate Decision-Making in the World of the Future? At Forbes.com, Bernard Marr writes in The Complete Beginner's Guide To Big Data In 2017 that the future of the world will be forged increasingly through the use and application of "Big Data" to decision-making. What does "Big Data" mean? "Big Data works on the principle that the more you know about anything or any situation, the more reliably you can gain new insights and make predictions about what will happen in the future. By comparing more data points, relationships will begin to emerge that were previously hidden, and these relationships will enable us to learn and inform our decisions." Does increased "Big Data" knowledge mean power? The future will tell us. At the ABA Journal, Debra Cassens Weiss has the story at Gorsuch takes two oaths of office to become a Supreme Court justice. There are few lives and careers so massively filled with impressive achievements as the life of William Thaddeus Coleman, Jr., who passed away on March 31, 2017 as the oldest then still living former Cabinet member. Just read the obituary of William T. Coleman Jr. by Dennis Hevesi at the New York Times. “Bill graduated #1 from Harvard Law School in 1946, served as the first African-American editor of the Harvard Law Review, and clerked for Supreme Court Justice Felix Frankfurter (alongside Eliot Richardson). "His memoir, “Counsel for the Situation,” was written with Mr. Bliss and had a foreword by Justice Stephen Breyer. In it, Mr. Coleman reflected on his own life and on the American legal system, and paid tribute to the people who had influenced him — blacks and whites, Republicans and Democrats. As noted in an April 3, 2017 correction at the New York Times to set the "small detail" facts exactly straight: "An earlier version of this obituary misstated the year Mr. Coleman graduated from Harvard Law School. It was 1946, not 1947. It also attributed a distinction to him erroneously. He was not the first black member of the Harvard Law Review; Charles Hamilton Houston had served on the board in the early 20th century. And the branch of the service that Mr. Coleman joined was rendered incorrectly. It was the Army Air Forces, not the Army Air Corps." At the ABA Journal, Debra Cassens Weiss reports that Interruptions of female justices has increased with their representation on SCOTUS, study finds. That research finding has made a lasting impression on us. Gentlemen! Let's stop interrupting the ladies. Neil Gorsuch has been confirmed by the American Senate as U.S. Supreme Court Justice, filling the seat vacated by the passing in 2016 of Justice Antonin Scalia. Gorsuch has an outstanding legal track record and was rightly confirmed -- in our opinion, although we disagree with Gorsuch on some fundamental issues of jurisprudence -- especially his adherence to the artificial dogma-like "crutch" of originalism. Judges cannot be merely "parrots of the past". More is required. Henry Ford would today not build a car the exact same way he did in the original days of the automobile. Things do change over time. Nothing stays the same. Law is no different. Law is a seamless "living" web that accommodates itself to the changing world as required. There is no doubt that Gorsuch is well-qualified as a judge per se, so that we hope that his Supreme Court job responsibilities will lead him to adopt a broader view of the U.S. Constitution as he matures in his Supreme Court seat. Gorsuch will turn only 50 on August 29, so he may have many years of judging ahead of him yet. Perhaps he will surprise us positively as time goes on. Joe Manchin III of West Virginia. The United States Supreme Court on March 21, 2017 held oral arguments on the first sale patent exhaustion case Impression Products, Inc. v. Lexmark International, Inc., which we previously discussed at First Sale and the Patent Exhaustion Doctrine in the Resale and Use of Printer Ink Cartridges. "15-1189 IMPRESSION PRODUCTS, INC. V. LEXMARK INTERNATIONAL, INC.
1. Whether a "conditional sale" that transfers title to the patented item while specifying post-sale restrictions on the article's use or resale avoids application of the patent exhaustion doctrine and therefore permits the enforcement of such post-sale restrictions through the patent law's infringement remedy. 2. Whether, in light of this Court's holding in Kirtsaeng v. John Wiley & Sons, Inc., 133 S. Ct. 1351, 1363 (2013), that the common law doctrine barring restraints on alienation that is the basis of exhaustion doctrine "makes no geographical distinctions," a sale of a patented article-authorized by the U.S. patentee-that takes place outside of the United States exhausts the U.S. patent rights in that article. "JUSTICE BREYER: What about Justice Kennedy's question? I mean, Lord Coke had that very question in mind, I think, that -- that one of the problems with restraints in alienation of chattel is that the buyer may not know, and -- and moreover, it stops competition among buyers. Those are the basic two things that have led that as a kind of underlying principle. Then why don't you require the person who sells it to just resell it with the requirement that they promise not to, you know, whatever it is? [O]ne of the reasons that it's hard to get away with that is the antitrust laws in the contract area. And another reason is because Lord Coke said 300 years ago, you know, it's -- you get into a lot of trouble when you start trying to restrict this buyer who's got the widget and he would like to use it as he wishes. Now, that's been the kind of basic legal principle for an awfully long time. There ... are all kinds of exceptions. But to go back to your basic point underlying this, of course, any monopolist, including a patent monopolist, would love to be able to go to each buyer separately and extract from each buyer and user the maximum amount he would pay for that particular item. Dentists would pay more for gold perhaps than someone who wants to use gold for some other thing. Okay? They'd like that. But by and large, that's forbidden under many laws, even though it does mean slightly restricted output, and it also means a lower profit for the monopolist. All right. Now, it's against that background that I think the law and economics professors, who are telling what is correct, that -- and the argument that you're making has to be evaluated. That's what I think on the first part. All this precedent is very hard for you to get around. And I'm not talking about just Lord Coke; I'm talking about the Supreme Court precedent." The government of the United Kingdom has now invoked Article 50 of the Treaty on European Union and has thus formally triggered the UK intention to leave the EU, a separation widely called "Brexit" for short. In two years, Brexit will finalize the divorce of the UK from the EU, but that divorce does not automatically repeal laws in force in the United Kingdom. Brexit has many complex legal aspects, many of which will beset Europe and beyond for many years, among which is a widespread misunderstanding of how EU Law applies to UK persons and businesses in the interim ... and beyond. Brexit itself does not nullify laws in effect in the UK. Survey reveals UK business' misunderstanding on GDPR and Brexit. The GDPR is the General Data Protection Regulation, which goes into effect in the EU before Brexit occurs. The UK government has said that the GDPR will be adopted in the UK regardless of Brexit. What happens thereafter is then up to the lawmakers in the United Kingdom. In a surprise to us, as reported at BBC News, the House of Lords has backed down on its initial stance on the House of Commons Brexit Bill, giving the present UK government a blank check to trigger leaving the European Union without a previous handling of the after-Brexit rights of present European Union residents in the UK. The rationale of the House of Lords was stated to be to avoid "divisiveness", a laudatory aim. However, the Brexit referendum with a near 50/50 vote result remains politically divisive ... regardless. Our surprise is based especially on the fact that we are aware of numerous EU citizens (both in and out of the UK) whose personal and professional lives are integrally tied to the manner in which Brexit is ultimately implemented. It must be emphasized that the issue of EU citizens' rights in the UK, as well as UK citizens' rights in Member States of the European Union after Brexit is not a "theoretical" legal construct, but represents a very acute real problem. As widely reported, some UK citizens working and residing in other EU Member States have already applied for or have already obtained dual foreign citizenship in those countries to counteract further possible personal losses and deprivations based on their "in limbo" status. It is of course apparent that the nationalistic populist trend we see elsewhere in the USA and in Europe is also present in the UK. Obviously, a main objective is "exclusion" of outsiders, which is a territorial political decision. There is e.g. an ongoing "exclusionary war" from which neither the EU nor the UK are excepted. In addition to the selective travel ban in the USA, see e.g. the visa war at EU escalates 'visa war' with US with Americans set to lose visa-free travel to Europe. We are similarly familiar with several recent cases of persons applying for various visas in the UK. The UK fees for visa application are steeply priced. The scope of the required visa application paperwork is considerable. And there is no guarantee that the application will be granted. Perhaps matters will get better once the UK leave of the EU is final.